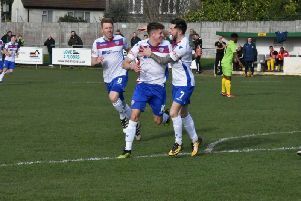 Andy Peaks was pleased to get everything he wanted out of AFC Rushden & Diamonds’ midweek outing. Diamonds cruised into the final of the NFA Hillier Senior Cup thanks to a 6-0 victory over Future Lions United Counties League Premier Division side Cogenhoe United at Hayden Road. Top scorer Tom Lorraine hit a first-half hat-trick before goals from Declan Rogers, John Dean and Jack Bowen wrapped it up after the break. It was Diamonds’ first match action since the 1-1 draw with Banbury United on January 26 after last weekend’s Evo-Stik League South Premier Division Central trip to Rushall Olympic fell victim to the weather. They made no mistake to set up a final against Vanarama National League North side Brackley Town after they edged out Brackley Town Saints 1-0 in the other semi-final. And Diamonds boss Peaks was delighted with how the evening panned out. “I was really pleased, we did exactly what I wanted us to do,” he said. “Having not played for 10 days, we used the first-team squad and we put out a strong line-up just to give everyone a bit of time before a big game at the weekend. “You have to give credit to Cogenhoe because, at 1-0, they had some chances which they really needed to take. “But we got a good, convincing win and that’s what we wanted. We are in a cup final and it’s something to look forward to later in the season. “We expected it to be Brackley who got through and it will give us the opportunity to pit our wits against a team from a higher level.